MicroRNAs (miRNAs) are short non-coding RNA molecules that play a critical role in mRNA cleavage and translational repression, and are known to be altered in many diseases including breast cancer. MicroRNA-10a (miR-10a) has been shown to be deregulated in various cancer types. The aim of this study was to investigate miR-10a expression in breast cancer and to further delineate the role of retinoids and thyroxine in regulation of miR-10a. Following informed patient consent and ethical approval, tissue samples were obtained during surgery. miR-10a was quantified in malignant (n = 103), normal (n = 30) and fibroadenoma (n = 35) tissues by RQ-PCR. Gene expression of Retinoic Acid Receptor beta (RARβ) and Thyroid Hormone receptor alpha (THRα) was also quantified in the same patient samples (n = 168). The in vitro effects of all-trans Retinoic acid (ATRA) and L-Thyroxine (T4) both individually and in combination, on miR-10a expression was investigated in breast cancer cell lines, T47D and SK-BR-3. The level of miR-10a expression was significantly decreased in tissues harvested from breast cancer patients (Mean (SEM) 2.1(0.07)) Log10 Relative Quantity (RQ)) compared to both normal (3.0(0.16) Log10 RQ, p < 0.001) and benign tissues (2.6(0.17) Log10 RQ, p < 0.05). The levels of both RARβ and THRα gene expression were also found to be decreased in breast cancer patients compared to controls (p < 0.001). A significant positive correlation was determined between miR-10a and RARβ (r = 0.31, p < 0.001) and also with THRα (r = 0.32, p < 0.001). In vitro stimulation assays revealed miR-10a expression was increased in both T47D and SK-BR-3 cells following addition of ATRA (2 fold (0.7)). While T4 alone did not stimulate miR-10a expression, the combination of T4 and ATRA was found to have a positive synergistic effect. The data presented supports a potential tumour suppressor role for miR-10a in breast cancer, and highlights retinoic acid as a positive regulator of the microRNA. MicroRNAs (miRNAs) are an important class of short non-coding RNA molecules proven to have a critical role in mRNA cleavage or decay . miRNAs play crucial roles in a variety of physiological as well as pathological processes including breast cancer . They have been shown to be dysregulated in both tissue and circulation of cancer patients [3-7]. miR-10a is located on chromosome 17q21.32 and is a member of the HOX gene cluster (HOXB and HOXD) . In the miR-10 family, particularly miR-10a/b display relevant roles in developmental pathways which also feature in cancer-related processes . Deregulation of miR-10a has been reported in a number of cancers, including gastric, cervical and thyroid cancer [10-12]. Loss of miR-10a expression was reported in gastric cancer tissues, and in cell lines. This report highlighted a potential tumour suppressor role for miR-10a, partly mediated through DNA methylation . Elevated expression on the other hand was observed in primary cervical tumours. This was associated with an increased risk of developing metastasis facilitated by its binding to phosphatase tensin homologue (PTEN) . Inhibition of both miR-10a and miR-10b was found to promote metastasis in neuroblastoma cell lines [13,14]. In the context of breast cancer, miR-10a expression has been shown to display both oncomiR as well as tumour suppressor roles [15-17]. Elevated miR-10a expression in estrogen receptor (ER)-positive tumours was associated with a longer relapse-free time following Tamoxifen treatment . A study by Chang et al. reported a trend towards increased expression of miR-10a in breast tumours compared to matched tumour associated normal tissues. This study implicated both miR-10a/b expression to be associated with adverse outcomes for breast cancer patients. A study by Pogribny et al. also showed higher expression of miR-10a in breast cancer MCF-7 cell lines with an inbuilt resistance to cisplatin. This analysis identified a potential role for miR-10a in the regulation of cellular proteins, including homeobox family HOXD10, tumour suppressor p27 and ER-alpha (ERα) . Loss of miR-10a expression has been reported by Peres-Riva et al. . A microarray analysis was performed on primary breast tumours from patients with early and late recurrence of the disease. The level of miR-10a was significantly reduced in patients with early breast cancer recurrence, potentially predicting patients at risk of developing recurrence of the disease. A global miRNA profiling study revealed miR-10a to be involved in inhibition of HOXD4 expression in breast cancer cell lines . All-trans-retinoic acid (RA) is a known anti-cancer agent, implicated in a variety of cancers, including lung, head and neck, and haematological malignancies [19-21]. This has been shown through its anti-proliferative, pro-apoptotic and anti-oxidative effects in cell line and animal models . One of the key regulatory targets of RA is retinoic acid receptor beta (RARβ) . It has been revealed to inhibit breast cancer cell proliferation in vitro [24,25], and has also been shown to inhibit mammary carcinogenesis in mice . This group and others have reported reduced expression in tumours [27-30]. This protein also has been shown to have a potential tumour suppressor role in breast cancer and is known to dimerize with Thyroid hormone receptor alpha (THRα) [27,31-33]. Studies have reported a link between miR-10a and RA [13,14,34]. In T cells, stimulation with RA alone, or combined with transforming growth factor beta (TGF-β) has been shown to induce miR-10a expression . This type of stimulation by RA has also been reported in a pancreatic and a neuroblastoma cell line model as well as during smooth muscle differentiation [14,35,36]. Based on the conflicting studies to date, the aim of this study was to establish the baseline expression of miR-10a in breast cancer and any potential relationship with RA and L-Thyroxine. Expression of miR-10a was quantified in tissues from breast cancer patients (n = 103), healthy controls (n = 30) and patients with benign breast disease (n = 35). Any relationship with clinicopathological details was investigated. RARβ and THRα gene expression were previously quantified in the same cohort and any association with miR-10a expression was examined. The impact of RA and L-Thyroxine (T4) on miR-10a expression was also determined. All experimental procedures involving tissue samples from human participants were approved by the Clinical Research Ethics Committee (University College Hospital, Galway). Written informed consent was obtained from each patient and all clinical investigation was performed according to the principles expressed in the Declaration of Helsinki. Breast tissue specimens (n = 168) were obtained at University College Hospital, Galway. The clinical patient samples comprised of 103 malignant tissue biopsies, 30 normal mammary tissue biopsies obtained at reduction mammoplasty, and 35 fibroadenoma tissues which are benign breast disease tissues. Full patient demographics and clinicopathological details were collected and maintained prospectively (Table 1). Samples were immersed in RNAlater® (Qiagen) for 24 hours, then the RNAlater® was removed and the tissue stored at −80°C until required. T47D and SK-BR-3 breast cancer cell lines were previously purchased from the American Type Culture Collection (Manassas, VA). T47D cells were cultured in RPMI-1640 media and SK-BR-3 cells were cultured in McCoy’s 5A. Both media types were supplemented with 10% fetal bovine serum (FBS) and 100U/ml penicillin/ 100 μg streptomycin (P/S). Cells were incubated at 37°C and 5% CO2 with a media change performed twice weekly and passage every 7 days. Breast tissue specimens or cell pellets were homogenised in 1 ml TRIzol® lysis reagent (Invitrogen) as previously described . Total (large and micro) RNA was extracted from malignant (n = 103), normal (n = 30) and fibroadenoma (n = 35) mammary tissue using the RNeasy Mini Kit (QIAGEN) as per manufacturer’s instructions. 1 μg of large RNA was reverse transcribed using SuperScript III reverse transcriptase enzyme (200U/μl), 0.1 M DTT, RT-5x Buffer, RNaseOut Ribonulease Inhibitor (40U/μl), Random primers (3 μg/μl) and dNTP’s (100 mM)-Promega (Invitrogen, Carlsbad, CA, USA). TaqMan® Gene Expression Assays targeting RARβ and THRα (Table 2) were used in TaqMan® Universal Mastermix (Applied Biosystems). 100 ng of mature miR-10a (Table 2) was reverse transcribed using the MultiScribe™-based High-Capacity cDNA Archive Kit (dNTP 100 mM, RT Buffer 10x, RNase Inhibitor 20U/μl, Stem loop primer 50nM, MultiScribe RT 50U/μl) (Appied Biosystems). The resulting cDNA for both mRNA and microRNA was analysed using the ABI 79000 Fast real-time PCR system (Applied Biosystems). These reactions were carried out in a final volume of 10 μl comprising of 0.7 μl cDNA, 5 μl TaqMan® Universal PCR fast Master Mix (2×), 0.5 μl TaqMan® primer-probe mix (0.2 μM), Forward primer (1.5 μM), and Reverse Primer (0.7 μM) (Applied Biosystems). The RQ-PCR cycle comprised of 10-minute incubation at 95°C followed by a 40 cycles at 95°C for 15 seconds and 60°C for 60 seconds. The use of an Inter-assay control derived from a breast cancer cell line (T47D) on each reaction allowed comparison of data across plates, and all reactions were carried out in triplicate with a standard deviation of < 0.3 between replicates considered acceptable. The relative quantity of mRNA and miRNA expression was calculated using the comparative cycle threshold (ΔΔCt) . The endogenous controls used for gene expression were Mitochondrial Ribosomal Protein L19 (MRPL19) and Peptidyl-Prolyl Isomerase A (PPIA) . For the miRNA analysis, let-7a was employed as an endogenous control . The geometric mean of the Ct value was used to normalise the data and the sample with the lowest expression level was applied as a calibrator. T47D and SK-BR-3 cell lines were seeded at 2.4×104 cells/cm2 in a 6-well plate. The following day, the cells were exposed to all-trans Retinoic Acid (ATRA, 0.1 μM, 1 μM, 5 μM) or L-Thyroxine (T4, 0.1 μM, 0.5 μM, 5 μM) for 24 hours. This was carried out to establish optimal concentrations for the assay . Once optimal concentrations were established (ATRA, 1 μM, 5 μM and T4 0.5 μM), the assay was then performed in triplicate in both cell lines. The cells were also exposed to a combination of ATRA (1 μM or 5 μM) and T4 (0.5 μM) for 24 hours. Controls included cells cultured in the appropriate diluents used for each stimulant. Dimethyl sulphoxide (DMSO, 0.5%) for was used to dilute ATRA. Ammonium hydroxide (NH4OH, 0.1%) was the appropriate diluent for T4. Cells were harvested at the appropriate time point by trypsination, centrifuged at 120 × g for 4 mins and the cell pellet stored at −80°C. Total large and microRNA was extracted, and the corresponding cDNA analysed using RQ-PCR targeting miR-10a, RARβ and THRα. The endogenous controls used were let-7a for miRNA analysis, and MPRL19 and PPIA for gene expression analysis as previously described. The data was expressed relative to cells cultured in appropriate diluent controls. All data are presented as Mean (SEM), and graphically represented using box plots and linear scatter plots. A general ANOVA model was used to compare mean responses. Scatter plots were displayed using Linear Regression and Lowess smoother to determine the relationships between different populations. The level of relationship was determined using Pearson correlation coefficients. MicroRNA extracted from malignant (n = 103), normal (n = 30) and fibroadenoma (n = 35) breast tissue biopsies (Table 1) was analysed by RQ-PCR. Levels of miR-10a were significantly decreased in breast cancer tissues (n = 103, 2.3(0.08) Log10 RQ) compared to both normal (n = 30, 3.1(0.17) Log10 RQ, p < 0.001) and fibroadenoma tissues (n = 35, 2.9(0.15) Log10 RQ, p < 0.001, Figure 1). miR-10a expression was further stratified based on patient clinicopathological details. Expression of miR-10a was not dysregulated across epithelial subtype (p = 0.168), tumour grade (p = 0.299), tumour stage (p = 0.340) or menopausal status (p = 0.126, results not shown). MicroRNA-10a (miR-10a) expression in normal, fibroadenoma and malignant breast tissues. RQ-PCR of miR-10a revealed significantly decreased levels of expression in breast cancer n = 103 (Mean(SEM) 2.3(0.08)Log10 Relative Quantity (RQ)) compared to normal tissue n = 30 (3.1(0.17) Log10 RQ, p < 0.001) and fibroadenoma tissues (n = 35, 2.9(0.15) Log10 RQ, p < 0.001). Expression levels of RARβ and THRα were previously reported by this group, on a total of n = 100 breast tissues, consisting of n = 75 breast cancers, n = 10 fibroadenoma tissues and n = 15 normal breast tissues . Supplementary data shows results from increasing patient sample number to include a total of n = 168 breast tissues for the analysis. This RNA was extracted from an additional n = 27 breast tumours, n = 20 fibroadenoma and n = 15 normal breast tissues was quantified by RQ-PCR targeting RARβ and THRα. RARβ gene expression was found to be significantly down-regulated in breast cancer (n = 101, 0.83 (0.04) Log10 RQ) compared to both normal (n = 27, 1.35 (0.09) Log10 RQ, p < 0.001) and fibroadenoma tissue (n = 32, 1.49 (0.07) Log10 RQ, p < 0.001, Additional file 1: Figure S1.). 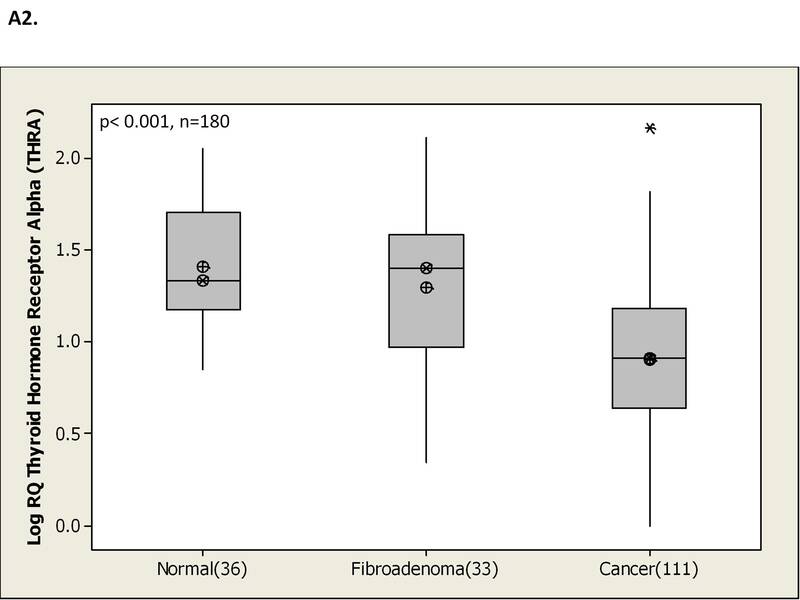 No significant association was observed with epithelial subtype (p = 0.122), tumour grade (p = 0.363), tumour stage (p = 0.614) or menopausal status (p = 0.635, results not shown). Levels of THRα were found to be significantly decreased in breast cancer (n = 101, 0.90 (0.03) Log10 RQ) compared to both normal (n = 27, 1.50 (0.06) Log10 RQ, p < 0.001) and fibroadenoma tissues (n = 32, 1.28(0.07), p < 0.001, Additional file 2: Figure S2.). 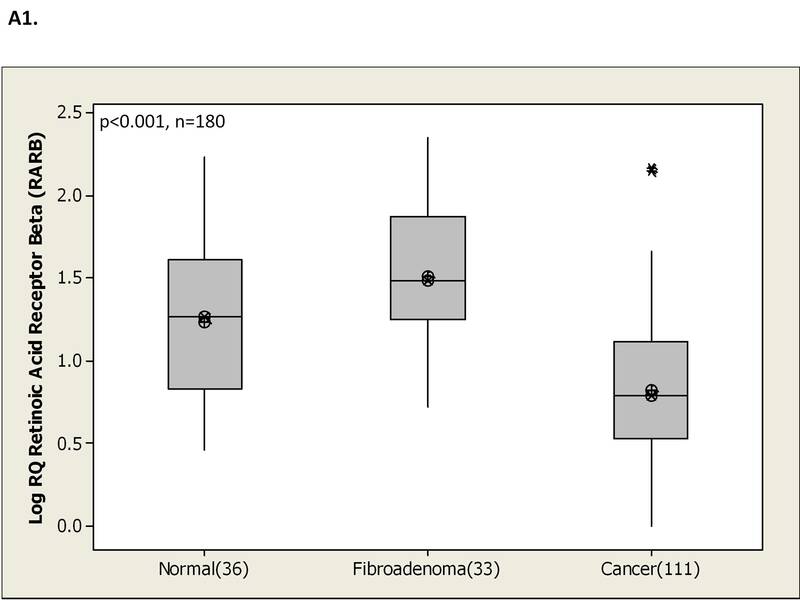 Further analysis revealed THRα expression was not significantly deregulated across epithelial subtype (p = 0.116), tumour stage (p = 0.859) or menopausal status (p = 0.679, results not shown). Expression of miR-10a across 168 breast tissues was correlated with the gene expression results for RARβ and THRα. A significant positive correlation with RARβ gene expression was observed (r = 0.31, p < 0.001, Figure 2A). miR-10a expression also revealed a robust positive correlation with THRα gene expression (r = 0.32, p < 0.001, Figure 2B). Pearson Correlation of miR-10a and Retinoic Acid Receptor Beta (RARβ) and Thyroid hormone receptor alpha (THRα). (A) Pearson correlation of miR-10a and RARβ revealed a significant positive correlation (r = 0.31, p < 0.001). (B) The same positive correlation was observed between miR-10a and THRα (r = 0.32, p < 0.001). This study was performed to determine the impact of all-trans retinoic acid (RA) and L-Thyroxine (T4) on miR-10a expression in vitro. The following concentrations were selected for the analysis, ATRA (1 μM and 5 μM) and T4 (0.5 μM). This was determined based on preliminary studies, and reflected the most effective doses. Cells were harvested, and changes in miR-10a expression were quantified by RQ-PCR. In the case of the T47D cells, miR-10a expression was shown to be stimulated at 1 μM ATRA (2.2 fold, SEM(0.6), p = 0.11) and 5 μM ATRA (2.3 fold, SEM(0.7), p = 0.2). In the presence of 0.5 μM T4, no stimulation of miR-10a expression was observed (0.64 fold, (0.08), p < 0.05). When combining both reagents, a significant synergistic increase was shown at 1 μM ATRA+ 0.5 μM T4 (3.1 fold, (0.3), p < 0.005) and at 5 μM ATRA+ 0.5 μM T4 (3.4 fold, (0.8), p < 0.05). In the SK-BR-3 cells, ATRA alone had a significant impact on miR-10a expression (3.5-4.1 fold (1.2) p < 0.005, Figure 3B). Similar to the T47D cells, SK-BR-3 cells did not show a change in miR-10a expression following stimulation with T4 alone (0.7 fold (0.5)). Combining ATRA and T4 resulted in a synergistic impact on miR-10a expression (2.5-2.6 fold (0.2), p < 0.005). miR-10a Expression in breast cancer cell lines following stimulation with All-trans Retinoic Acid (ATRA) or L-Thyroxine (T4) alone or in combination. (A) miR-10a expression was quantified by RQ-PCR in T47D cells following 24 hours stimulation with ATRA (1 μM and 5 μM) and T4 (0.5 μM) alone or in combination and (B) in SK-BR-3 cells. The impact of ATRA or T4 on receptors was also determined. In the T47D cells, RARβ gene expression was increased by 99–183 fold following stimulation with ATRA alone (Figure 4A). The addition of T4 abrogated this effect (76–92 fold increase). Stimulation with T4 alone or in combination had no impact on expression of THRα (0.8-1.5 fold, Figure 4B). In the SK-BR-3 cells, combination of ATRA and T4 stimulated increased RARβ expression (37–48 fold increase, Figure 4C), with no change observed in THRα (Figure 4D) or RARβ in any other conditions. Retinoic acid receptor beta (RARβ) and Thyroid hormone receptor alpha (THRα) gene expression following In Vitro Stimulation in breast cancer cell lines with ATRA or T4 alone or in combination. (A) RARβ gene expression in T47D cells (B) THRα gene expression in T47D cells (C) RARβ gene expression in SK-BR-3 cells (D) THRα gene expression in SK-BR-3 cells. Currently there are varied reports on expression of miR-10a in breast cancer. Most recently, a study by Chang et al. quantified miR-10a levels in 108 breast tissues compared to matched tumour associated normal (TAN) tissues, and found no significant changes in malignancy. In contrast, the present study quantified the expression of miR-10a in a total of 168 breast tissues by RQ-PCR. Expression of miR-10a was found to be significantly reduced in breast cancer tissues (n = 103) compared to normal (n = 30) and benign breast disease tissues (n = 35). The different results observed between both studies might be as a consequence of the type of control tissue employed. The present study included control tissues from patients with no history of the disease as well as patients with benign breast disease, while the previous study looked at expression levels in tissue from the tumour-bearing breast of the same patients. The data reported here is also supported by another study, showing reduced miR-10a expression in 71 Formalin fixed, paraffin embedded (FFPE) breast tumour tissues from patients with early recurrence of the disease . This study by Peres-Riva et al. included a microRNA array on FFPE tissues, and determined that loss of miR-10a was associated with the likelihood of developing metastasis. Reduced expression of miR-10a was also previously observed in other types of cancers including gastric cancer and intestinal neoplasia [10,40]. No associations with patient clinicopathological details were observed in the current study. RARβ is a known tumour suppressor in breast cancer [24,27], confirmed in both cell line and animal models. In the present study, RARβ gene expression was significantly reduced in breast cancer tissues compared to healthy controls. THRα, which is known to dimerize with RARβ [32,33], has also previously been implicated to have a potential tumour suppressor role in breast cancer tissues, confirmed using western blot analysis [27,31]. In the present study, reduced expression was reported in breast cancer tissues compared to healthy controls. A significant positive correlation was observed between miR-10a and RARβ and with THRα in breast tissues. This observation supports a tumour-suppressor role for miR-10a, and instigated further analysis into the potential regulation of miR-10a through RA. Previously miR-10a expression has been shown to be regulated by RA , where elevated miR-10a expression in a pancreatic cancer cell line model was reduced using RA inhibitors. In another study, RA elevated miR-10a expression in T helper cells in vitro, resulting in enhanced plasticity of these helper cells . In the present study miR-10a expression was not affected by stimulation of T47D cells with ATRA or T4 alone. Treatment with a combination of ATRA and T4 on the other hand showed a greater than 2 fold change in miR-10a expression. In the Her2 amplified SK-BR-3 cell lines however, ATRA alone showed a 2 fold change increase in miR-10a expression compared to the ER positive T47D cells. Retinoids are used as chemopreventive and anticancer agents because of their ability to regulate cell differentiation, growth and proliferation and apoptosis . This data presented supports a potential tumour suppressor role for miR-10a in breast cancer, and highlights RA alone or in combination with T4 as a positive regulator of the miRNA. This work was funded by the National Breast Cancer Research Institute Ireland (NBCRI) and the Irish Cancer Society Collaborative Research Centre Breast-Predict (CCRC13GAL). Additional file 1: Retinoic acid receptor beta (RARβ) gene expression across all tissue types. RARβ is significantly decreased in breast cancer (0.8(0.04) log RQ) compared to both normal (1.3(0.09)log RQ) and benign (1.5(0.07)log RQ) p < 0.001 tissue. Interestingly RARβ is significantly elevated in benign compared to normal and malignant tissue (p < 0.001). Additional file 2: Thyroid hormone receptor alpha (THRα) gene expression across all tissue types. THRα is significantly decreased in breast cancer (0.9(0.03)log RQ) compared to both normal (1.5(0.06) log RQ) and benign (1.3(0.07)log RQ) p < 0.001. SK performed the analysis, functional assays and drafted the manuscript, CC aided in collection of tissue specimens and patient clinicopathological details, DW and JN aided in the statistical analysis of the data sets, MJK aided in study design and RMD participated in study design, coordination and manuscript preparation. All authors read and approved the final manuscript. Hoppe R, Achinger-Kawecka J, Winter S, Fritz P, Lo W-Y, Schroth W, et al. Increased expression of miR-126 and miR-10a predict prolonged relapse-free time of primary oestrogen receptor-positive breast cancer following tamoxifen treatment. Eur J Cancer. 2013;(0). http://dx.doi.org/10.1016/j.ejca.2013.07.145.